How many pairs do you have in your closet? In the colossal world of fashion, having something named “classic” is tantamount to getting a “gold” in the Olympics. Of all the styles and fads that come and go, a classic remains…with much love and contentment. It’s a masterpiece of a creator. This is true indeed for Charles “Chuck” H. Taylor, basketball player for the Akron Firestones and patron to the Converse All Star sneakers. Yep, the Converse All Star sneakers, now known to many as “Chuck Taylors” or “chucks.” It’s “just a piece of rubber and a canvas” but hell did they do it right! It looks soooo good that almost everyone has a pair of his or her own. The crazy colorful “chucks” fever has definitely hit the town again. Oh, hit me for using the word “again.” These sneakers as a matter of fact never really left the world of fashion. It’s just that it has been reinventing itself, adapting to the changes in style, resulting to the numerous designs and colors of the All Star sneakers. But before all that, let me indulge you with the rich history of these vintage sneaks. When the Converse Rubber Corporation opened for business in 1908, basketball was reaching the peak of its popularity. It was then that the company saw the need of developing a shoe that people could wear while playing basketball. After all the research and development they went through, the birth of the All Star Basketball shoe finally came in 1917. Now, who would have known that the first mass-produced sneakers in North America would be the oldest, most popular, and best selling sneakers of all time? Be that as it may, the kindly basketball player Chuck Taylor had an eye for beauty. Believing in the quality and appearance of the Converse sneakers, he joined the Converse sales force. He traveled around the world promoting the sneakers while, at the same time, endorsing basketball. He held basketball clinics for kids, earning him the moniker “Ambassador to Basketball.” Come 1932, the Converse Corporation showed gratitude to his steadfast efforts by adding his name “Chuck Taylor” to their Converse All Star sneakers. Now, 60% of all Americans own or have owned at least one pair of these Chuck Taylor’s sneakers and people all over the world are also into chucks. If you are clueless and too naïve to understand why one has to have his or her own Chuck Taylor’s, then let me give you five wonderful reasons why it’s called the best selling sneakers of all time. It’s COMFORTABLE. It’s light and very snug. It’s FUNKY! It’s very colorful and there are so many designs to choose from! The colors are crazy… really colorful. Oh, did I mention about it being colorful? It’s Colorful! It has VERY GOOD QUALITY. Chuck Taylor’s sneakers can last a lifetime…unless of course you intentionally destroy it. It’s a CLASSIC. It remains fashionable even if the sneakers have not changed one bit since 1923 (except for new colors and original designs, of course)… and they never will. Approximately 30,000 pairs of high top chucks are still sold each week worldwide. 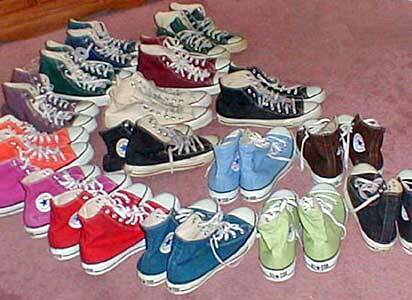 By the year 2003, over 580 million pairs of chucks had been sold. Chuck Taylor’s is now over 90 years old, and sales are very much growing. Can anyone imagine how many Chuck Taylor’s existed in the whole world?! Think about the movie I, Robot. Will Smith even had a pair of vintage Chuck Taylor’s in the year 2035! Now, don’t you just want to head to the mall and buy your very own chucks now? Shopping for a pair of chucks is like going inside a candy store. They all look so enticing that you just want to try everything and buy all of them. Decades ago, chucks were black sneakers. They later on made white chucks for the GI’s of the World War II. White high cut Chucks then became the “official” sneakers of the United States Armed Forces. Years went on and people started dying their chucks and the Converse Company eventually upgraded their All Star sneakers with basic colors (red, blue, etc.) With the creativity of other people, chucks were personalized and styled by them putting on drawings, studs, graffiti and the like. Now, there are numerous designs to choose from. Maybe years from now, we wouldn’t even be able to count the designs any longer. At any rate, with Chuck Taylor’s popularity, famous artists and celebrities of the past and present also brag about their passion for their very own chucks. [The late] Kurt Cobain of Nirvana, Brandon Boyd of Incubus, Winona Ryder, The Ataris, and Jakob Dylan are among the many who are very proud to wear their sneakers wherever they go. Well enough, Chuck Taylor’s sneakers have become a household name in the fashion world, and they will stay on and live forever. Chuck Taylor was a damn lucky guy.